One night last week, Jenny and I were in the kitchen, cleaning up after dinner, and Phoebe was sitting at the table, finishing her homework, surrounded by the contents of her scoliosis-inducing backpack. As Jenny checked Instagram and I scrubbed a pan of rice, talk turned to Thanksgiving — and our total lack of planning for it thus far. The way it usually works around here, Thanksgiving-wise, is that Jenny’s mom provides the turkey and the Jell-O chocolate pudding pie, and we are (happily) responsible for everything else: i.e., pan-roasted Brussels, cauliflower with anchovy breadcrumbs, three pepper cornbread stuffing, and mashed potatoes. “I assume we’re just making the usual?” I said. Phoebe, it should be noted, is a true creature of comfort. The stuff she likes, she really likes. Her bed, for instance, with its disintegrating quilt. Her house. Her little chair in her reading nook. Her Tintin collection. Her water-damaged Timex watch. Her pair of jeggings with the hole in the right knee. Her mashed potatoes. God, the kid loves mashed potatoes. Fast forward to the next day. I am at work and, in my building, there is an hour-long panel talk going on between Sam Sifton (author of Thanksgving: How to Cook it Well) and Gabrielle Hamilton, superstar chef and author of Prune. They talk about the beauty (and difficulty) of the three-ingredient recipe, the perfect temperature of butter when smeared on fresh radishes (waxy, never oily, and sprinkled with sea salt), and how they feed their kids (at this stage, Gabrielle says, her goal is simply caloric intake), and when they’re done, they take questions from the audience. First question: How do you guys feel about a traditional Thanksgiving? Pro or con? Sam, after pointing out that felt obligated to answer first since, as he noted, he “literally wrote the book on Thanksgiving,” said he believed in tradition, and in Thanksgiving as the Great American Secular Holiday — it was pretty stirring, I have to say — and one that should be properly celebrated as such. How many times a year, he asked, do you eat a turkey? Are you sick of turkey or something? Gabrielle agreed, and launched into this beautiful paean to the familiar smells and tastes of the Thanksgiving table, and talked about how there is no night she looks forward to more at the restaurant — where, after the place clears out and the customers have all gone home, the staff gathers for their “family meal,” with all the fixings. The point was, however you celebrate it, and whoever you celebrate it with, tradition matters. Note: I baked them in a 9-by-13-inch baking dish, so upped the quantity on the milk/cream mixture a bit. The important thing is the instruction to make sure the milk comes “almost to the top” of the layered potatoes. Preheat oven to 425. Combine milk and cream in a small saucepan and bring to almost a boil. Remove from heat and add garlic, nutmeg, salt, and pepper. Set aside. Lightly butter a 9-inch square baking dish or a 9-inch casserole with half the butter. Drain the potatoes and dry them lightly, then layer half of them in the dish so that they overlap slightly. Add half the milk, pouring it all over the potatoes. Layer the remainder of the potatoes in the dish, then add the rest of the milk so that it comes almost to their top. Top with dots of the rest of the butter and place in the upper third of the oven until the potatoes are browned and the milk has been absorbed, 45 minutes to 1 hour. Serve in its container. I agree with Phoebe, you can’t mess with the Thanksgiving mashed potatoes! 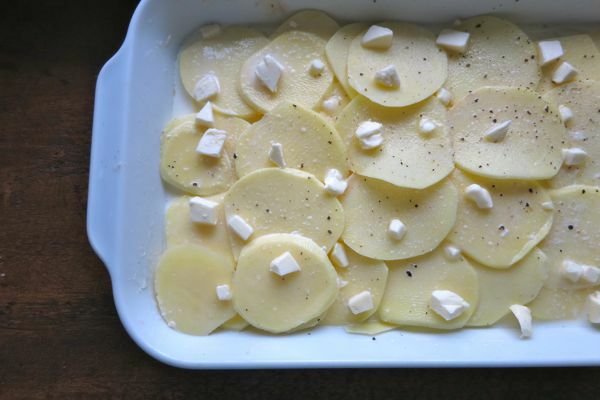 We would never even consider subbing out the mashed potatoes on Thanksgiving, but i’ve been a big fan of an earlier version of Andy’s potatoes au gratin. They have a pinch of red pepper and a smattering of cheese and onions. mmmmm…. Phoebe is one smart cookie. We literally just had this conversation last night about scalloped potatoes! I am a serious mashed potato fan, and my fiance is a serious scalloped potato. He has to wait for Christmas for his potato dish! Love this post. I’m all about trying new things, but I like strong, opinionated young people. Go Phoebe! It is Thanksgiving after all – why not both? At least she has an opinion. It is difficult being the cook when the eaters say they don’t care what is served–because they really do. The planning, shopping, prepping, cooking is a huge responsibility and it is nice to have a little input (but not too much!). See, I think this is where Americans differ from Canadians, in not so much that we celebrate Thanksgiving in October and you in November, but in that while we have our traditions we are also open to trying the new. The main is usually either a ham or turkey, but the sides are often so varied that having the same thing twice in a row is rare. Shredded sauteed Brussels Sprouts, mashed roots, a cool shredded salad of sorts, sweet peas, potatoes in all their cooked incarnations, creamed spinached, or even butter corn. Yes, this takes a little more prep to keep it varied, but it also adds excitement from those who will eat since I never tell them what will be presented ahead of time. Makes things fun that way. I agree with Phoebe. For a rare occasion, we are going to my husband’s family for Thanksgiving this year and they do not serve mashed potatoes. For the life of me, I don’t know why. But it’s lacking without them. I would bring them myself but they’re not really a make-ahead dish – I’m bringing the stuffing instead. Fortunately we are going to my family the next day for Thanksgiving (I guess it’s fine to eat turkey on another day too) and there WILL be mashed potatoes there, I’ll make sure of that! Haha I love the story! I have to say I am a bit of a mashed potato kinda gal but these look delicious too! Wow! That’s an awfully long text. I’m with Phoebe. Can’t mess with mashed potatoes on Thanksgiving. I make a scalloped potatoes dish for Christmas Eve every year, the secret ingredient being anchovies. I layer sautéed, diced onion and rinsed, diced anchovies in between the potato layers. Cream only (no milk), and it’s divine. No one ever guesses there are anchovies in there. Thought you guys would appreciate it. I agree with Phoebe. 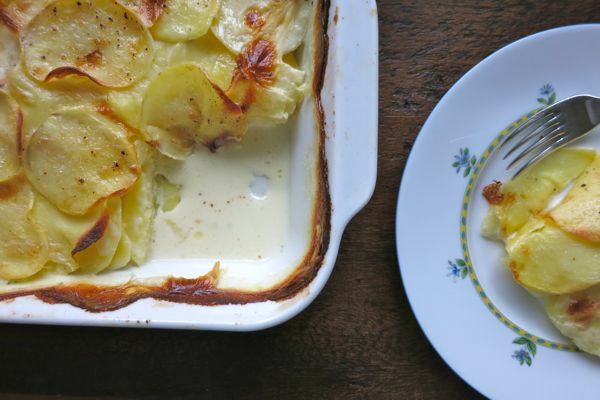 I LOVE scalloped potatoes, but not on the Thanksgiving table. Can we talk about the awesomeness of a kid to parent text that includes the phrase “in mashed potatoes’ stead.” Love her! Mashed potatoes are a must-otherwise where would the gravy hang out??? Certainly not on top of au gratin potatoes. When I think of au gratin potatoes I think of beef-perhaps Christmas or other December Holiday? Thanksgiving is the easiest “special” meal to plan because of the tradition. I usually try to add one new dish but everything else is set. We always have au gratin potatoes with the Christmas prime rib. Gratin Dauphinois! Yum. Goes so well with gamey meat! By all means, make the scalloped potatoes IN ADDITION to the mash. But do not omit the mash. Otherwise how will you make the little lake to pour the gravy in? Phoebe rocks: “I DO NOT permit you to serve these potatoes in mashed potatoes’ stead. The end.” Brilliant. I completely agree with Phoebe as well! My mom tried to make scalloped potatoes one year in place of mashed potatoes…I put my foot down on that one. Mashed potatoes are a must for Thanksgiving!!! In our house we get both rice AND mashed taters, and I love ’em both even though I come from southern stock, but grew up in the Pacific NW. Both get the requisite gravy, so there. My kids also insist on mashed potatoes, but I might have to try to make a half recipe of this on the side for the adults!